Sanderlings with breeding plumage spotted feeding on West Beach, Calvert Island. Top photo by Maria Shallard, bottom right by Julie Mundy, bottom left by Thalia Christou. 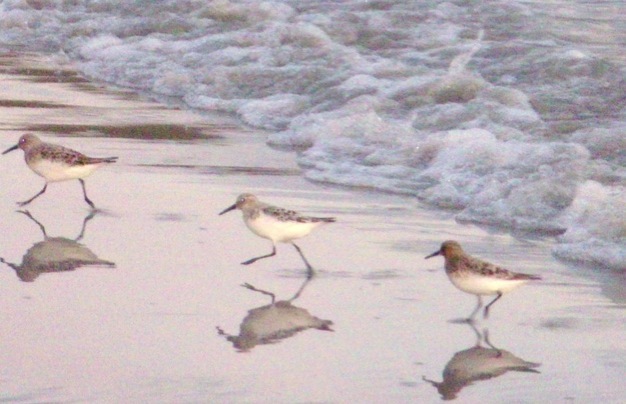 At 20 cm long, the small, plump sanderling is a medium-sized "peep" (small sandpiper). It has black legs and a relatively short and stout black bill, about the length of its head. In the winter it has the palest plumage of all sandpipers: a pale grey head and back, white underside, and black wingtips and marks at the shoulder. It acquires its breeding plumage in late April: its breast, head, and back turn rusty red peppered with black and white, while its underside remains pure white. It has a white wing-stripe that can be clearly seen in flight. 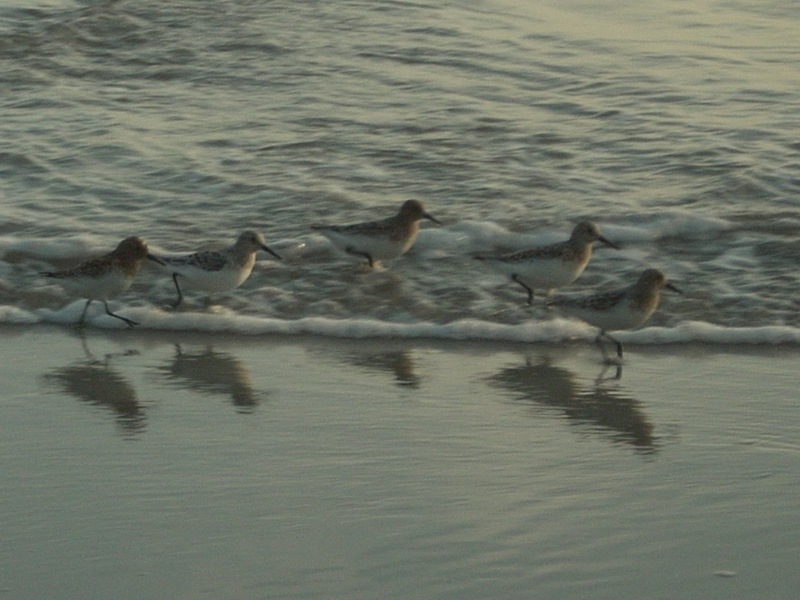 The sanderling is often found feeding on sandy beaches during winter as well as spring and fall migration. Its summer breeding range is in the high Arctic, where it nests on wet tundra and gravel patches. During winter it is found on coastlines in North, Central, and South America. During migration it can be found on some northern coastlines as well as inland locations, including the Great Plains region and the Great Lakes. Some non-breeding birds may remain in the winter range, particularly in South America. It may be found on the Central Coast in winter or during migration. Populations of this widespread species are also found on shorelines throughout the Eastern Hemisphere. Semipalmated sandpiper (Calidris pusilla) and least sandpipers (Calidris minutilla) are smaller, slimmer, and have darker breeding plumage. Western sandpipers are smaller and darker as well. Other shorebirds may try to feed alongside sanderlings, but they often do not get away with it as sanderlings can get aggressive while defending their shoreline feeding areas. Sanderlings have "obsessive wave-chasing habits" and can often be found scurrying quickly along shore while feeding on small marine invertebrates. They are uniquely well-adapted for running on sand, as they are missing a hind toe. This species is not considered threatened or at-risk of extinction, however there are concerns about some declining populations, as well as habitat degradation and disturbance. 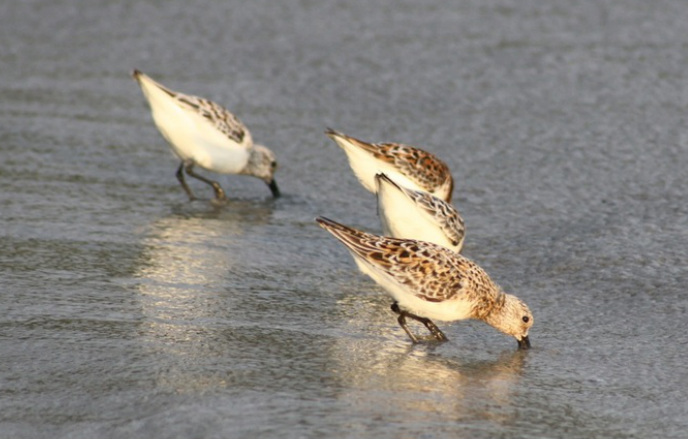 Read more on the ARKive sanderling page. Dunn, J. L. and Alderfer, J. (Eds.). (1999). National Geographic Field Guide to the Birds of North America. (3rd Ed.). Washington, D.C.: National Geographic Society. Pp. 172-173. Sanderling. The Birds of North America Online (A. Poole, Ed.). Ithaca: Cornell Lab of Ornithology. Retrieved from the Birds of North America Online. Accessed 05/07/2013. Sanderling (Calidris alba). ARKive.org. Accessed 05/07/2013.